Process Safety, Refrigeration Safety and Risk Management Made Easy! No need to search through stacks of paper or a file cabinets. Your data is stored electronically and is easily accessible. Using ePSM is as easy as it gets. Anyone on your team will be able to use our software, with our new modern user interface. Receive notifications online and by email for upcoming and elapsed tasks. Track the status of equipment and other assets. 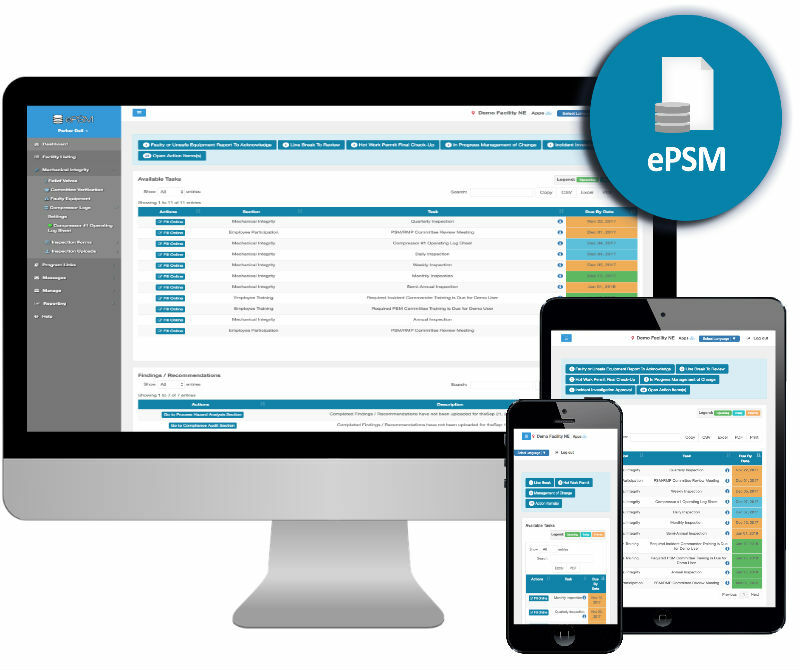 ePSM is an online service and maintenance application for Process Safety Information, Compliance Audits, Incident Investigation, Management of change, Employee Training, Emergency Planning, Contractor Safety and more. Unlimited file and data storage. Your data is 100% safe with our off-site redundant backup system, your data is backed up daily to multiple servers. You can access your program 24/7 with any internet ready device. Automated paperless inspections, allows you to complete your inspections, audits, or other forms on any mobile device, wherever you need to be. Capture and record line breaks for future references, while keeping track of ammonia and other allocations. Smooth completions of a Management of change have never been simpler. Keep track of all the oil going in and out of your system overtime. 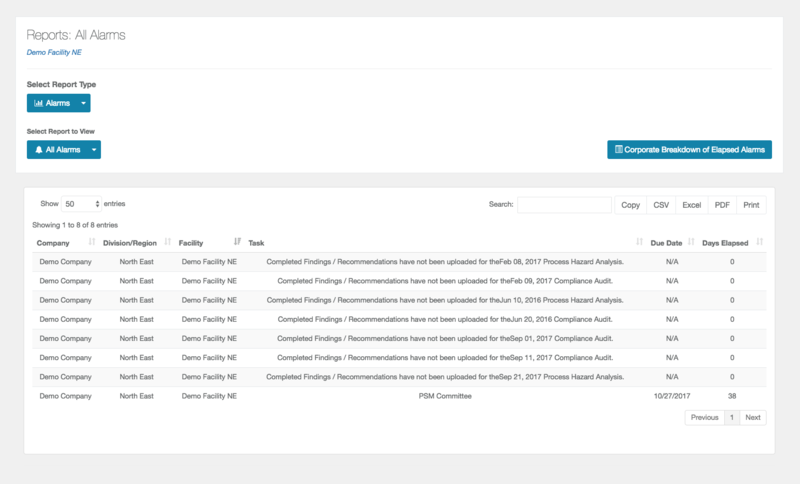 Easily record Process Hazard Analysis reports in your system and track their recommendations and findings. Track initial, revalidation and expansions reports. 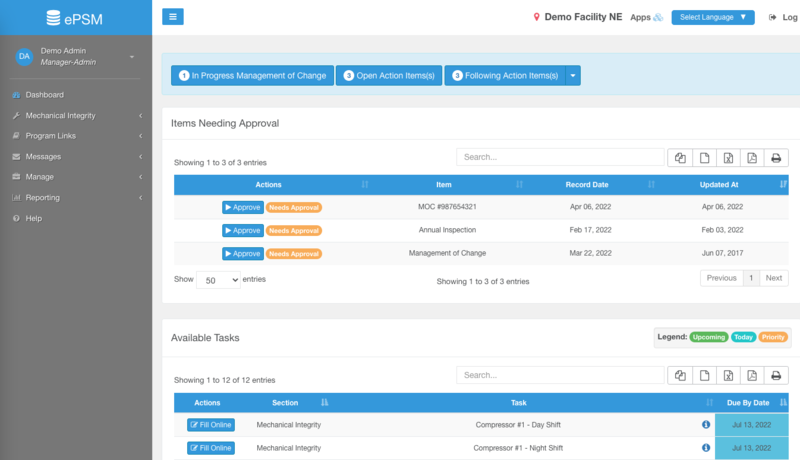 Multiple reports to help administration schedule and plan out future maintenance and training across company and sites. 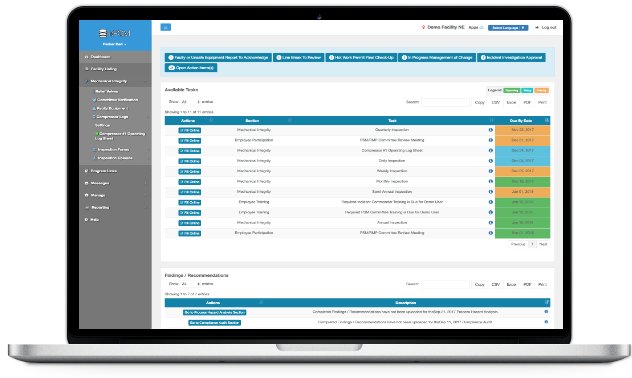 ePSM is web-based compliance software that will help you comply with OSHA's- Process Safety Management and EPA's- Risk Management. Don't let your PSM team struggle; get set up with ePSM today! Get rid of filing cabinets and other unnecessary paperwork. 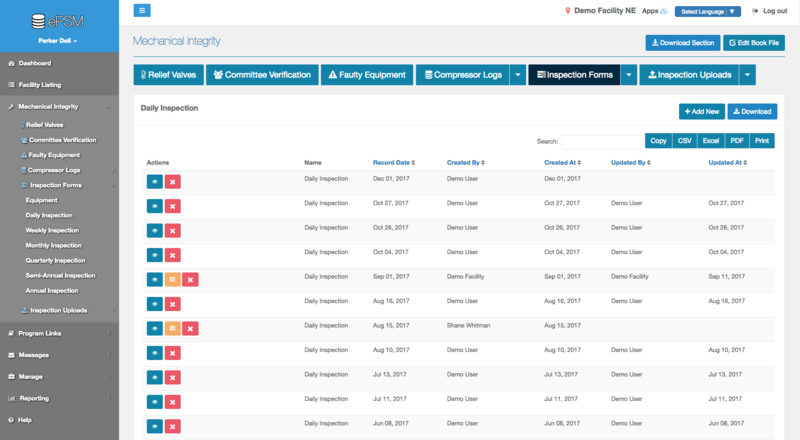 With ePSM you can add pictures, documentation, information on how to troubleshoot problems and more. Creating and managing PSM and RMP programs has never been more simplistic. Wide variety of customizable inspections for your every need! Inspections come with a comment section and follow-up indication field. 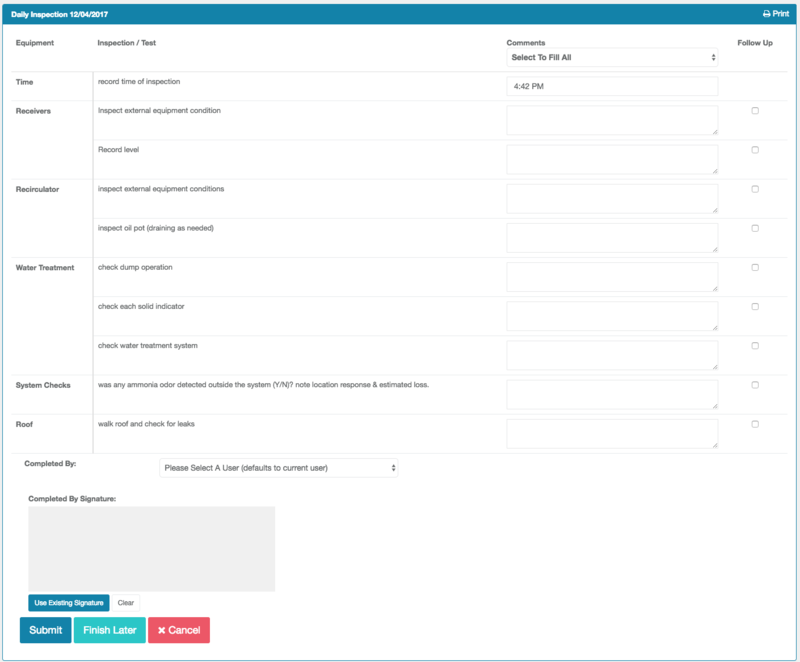 After completion, inspections are logged for later retrival with print friendly views. "Our platform boasts a customer retention rate of 99.7%. Our three hundred plus customers have completed more than a million audits and inspections on our software and trained three thousand plus employees on more than twenty thousand recorded occasions. Our customers speak for themselves!" ePSM takes the guess work out of OSHA's - Process Safety Management and EPA's - Risk Management, with its powerful alarming features, by default the ePSM will alarm for every element required by OSHA's - Process Safety Management and EPA's - Risk Management and even your state's Tier II reporting requirement. As federal OSHA and EPA regulations change, so will the ePSM, making it effortless to comply with regulation changes. ePSM is a registered trademark of eINNOVATIVE, Inc. Call +1 (540) 246-0494 M-F 8AM to 5PM EST.